He used to be so friendly! Leash aggression is our most popular seminar, and the spring and summer seminars are doubled in frequency due to the number of dogs out and the longer duration of the walks. So in other words, it’s not just your pup. Most puppies go bounding up to any dog they see, sure that everybody is going to love them. However, many, many, many dogs hit a point of social maturity and they are no longer friendly while on a leash (even if they’re lovely off-leash). As far as the “why,” which owners always want to know the answer to, it’s usually one of two things. With some dogs, it’s fear. The fearful dog yells at any dog he sees to make the point that nobody better mess with him! He’s MEAN! The other answer is that it comes from frustration. That friendly dog wants to say hello to every dog he can, but you just can’t get him over there fast enough, or the other owner has informed you that his dog isn’t so nice. When Buster wants to say hello and doesn’t get to, he gets frustrated. After a few frustrating experiences, he starts to pull harder on the leash, cry, eventually bark, and often times, eventually that frustration turns to aggression. Regardless of the “why” the treatment is the same. Your dog is likely to have a stronger reaction if the other dog is moving (with the usual exception of a dog walking away). Stationary dogs might still get a reaction, but not as big. Dogs in pairs tend to feed off of each other, whereas larger groups are less reactive on leash. 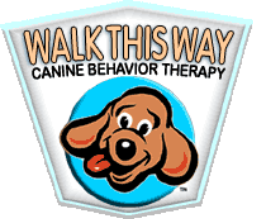 The treatment we’re going to use can also be used on a dog that is leash aggressive toward people, bikes, strollers, etc. Make sure your dog is wearing a collar that gives you control but also provides for a choke-free walk. If he’s lunging at the end of the leash and his regular collar is cutting off his windpipe, that’s not the best association he’s making with other dogs. For dogs that are fairly leash aggressive, I will only use a Gentle Leader in the beginning. That collar allows you to steer your dog’s head away from the other dog if he’s not responding to your efforts. Start these exercises at a reasonable distance. Don’t start off two feet away from a dog unless that’s ok for Buster. More than likely, you’ll need to be a quarter of a block away or across the street to start with. Make sure your treat is excellent. If your pup isn’t terribly food motivated outside, try something he never gets – chicken or cheese are usually safe bets. And no, he’s not going to beg at the table unless you start feeding him that chicken and cheese off your dining plates. The first thing we’re going to do is teach your dog what a clicker is. You can get a clicker from most pet stores. The click always, always, always means treat. You’re going to teach Buster that piece of information by loading up with treats and clicking and treating until you see his eyes light up when he hears that noise. Click only once per treat (this is VERY important). I always tell people to get in the habit of clicking, talking in a happy voice and THEN treating. That’ll buy you some time if your treat isn’t as handy as it should be on the street. If you have a noise-sensitive dog that is afraid of the clicker, which is not terribly common but does happen, you can substitute a word like “cookie” or “treat” or “look.” Just be sure that you are very present in your vocal delivery. It’s hard to replace the clicker. You’re going to click and treat (remember – from a reasonable distance) as soon as your dog sees another dog. We’re not waiting for a reaction; we’re just teaching Buster that the presence of another dog equals a treat. If he takes his treat and then focuses his attention back on the other dog, click and treat again. You can repeat this as many times as you want, just make sure that you never click without offering a treat (even if Buster snubs your offer). The main thing to keep in mind is that although you’ll see improvement fairly quickly, you haven’t fixed him yet. You MUST continue for two-three months. He’ll reach a point (hopefully before that time) where he sees a dog and looks at you before you even have a chance to click. At that point, you can lose the clicker and keep the treats. Eventually, you can reward more randomly, maybe for proximity, the behavior or size of the other dog, etc. If you make a mistake or don’t see a dog coming, don’t worry. If Buster starts barking, just tell him “that’s enough” and turn him and make him walk away from the other dog. While some trainers do use what we call a “quick hello” to teach the dog to eventually be able to say hello on leash, I don’t. The reaction of the other dog is too unpredictable, and I just don’t believe that dogs were designed to walk around on a leash and greet their own. Reserve social time for off-leash areas. On the same note, if there are dogs that you know your dog loves and saying hello to those select dogs will absolutely go successfully, make sure you put it on command – “Let’s go say hello to Buddy!” Don’t leave it up to your dog to make the decision. If you do, he’s going to have a hard time understanding why he can’t always make the decision. As easy as it sounds, most people like a little professional help with these exercises. We offer leash aggression seminars several times per year, and the problem can also be addressed in a private lesson. A great book on the topic of dog on dog aggression is Jean Donaldson’s “Fight!” available from www.dogwise.com.